Upload Files To Blogger. ~ The Blog Doctor. You are here: Home > Upload Files > Upload Files To Blogger. There is a total limit of 300MB on the pictures you are uploading through Blogger, Picasa, or Hello to a free BlogSpot blog. If it is a ftp blog then it is space on your server you should take into account. If you are posting pictures through Blogger Mobile there is a limit of 250K per picture. However there is no way to know whether this limit is approached until you break through it. Individual pages of your blog are limited to 1MB size. Your main page may run into this limit so limit the number of posts on main page by going to Settings----->Formatting----->Show 4 posts on Main Page----->Save Settings. This will also speed up the loading of your blog. There is no limit to number of blogs you have or number of posts you can make. Also there is no limit to number of comments. Individual posts do not have limit but may be limited by page-size as described above. When viewers click on "DOWNLOAD FILE" they will get a dialog box prompting the to download your file. 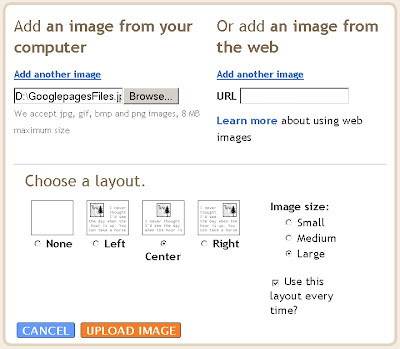 In this manner you can also create an image link as described in Making Image Link. 50 VIEWERS CLICKED HERE TO COMMENT ON THIS POST. ADD YOUR COMMENT. I was trying (unsuccessfully) to include a sound clip on my blog and finally got it right after reading this post. Thank you so much! Can you tell me how do they do that? Great Info. The google pages did the trick. I wanted to talk about one my emails and I wanted to attach that email txt. wow took me a long time searching the net but finally it paid off when i found this site.Thank you very much!! I'll have to keep on saying "Thanks!" for all the help your blog has given me. I've successfully downloaded a .pdf file that I wanted to share, with the help of your clear instructions! You can allso join a SlideShare communetie and upploa 30 MB files, and link the files to your blog. Se my latest posting in Utsira as Way of Life. Labels for Bloggers: BillGatesFreestuff. thank you for your help! i was bummed when i found out i couldnt post a pdf file on my blog. but after searching, i found your answer and it worked! thanks again! How to Submit Site to Google? You're the best. I found your post right away and Googlepages was the perfect solution for me to enable a free e-cookbook download on my blog. You helped make it happen! Thanks so much. Keep it going! What is the address of your post/blog where you have put this link in? Me, too. I also have a blog of blogspot. Once, I wanted to post about java applet. But it seemed that it's impossible to upload the "class" file of java applet because I want to show special java applet on my blog. What a pity! I can't do that. This is a good blog. Good work. Great post! Worked all right with me (and this doesn't always always happens with me... lol) and solved me another old problem. Thanks a lot Vin! You are super! thanks for the information its useful. OH my... I am very new at this blogging and seem to be confused. When I login to my dashboard it says I am not an author to a blog however I think I am? How do I fix this? You can ask the Admin to send you an invitation to author posts on that blog. Also try clicking the invitation link in your email inbox if you can locate the email. Check that you can see all blogs on Dashboard by clicking Show All link at bottom. google pages r not accepting new sign ups so where should I host files like exe . I followed your directions and they were awesome. I put the file up, hit preview and can see it on the blog. However, after I save the changes, it does not show up on the blog page - any suggestions? If you want to show file on blog instead of just the link use Scribd. Thanx very much. Wanted to post a pdf file in a blog and this post helped me sove that! Thank you. I had uploaded a pdf to google docs, but you had to sign into google to see it. google groups worked. Actually this is needed because I would like to show my blog info on alexa. Blogger does not allow you to upload any file to the root. Use another method if present or contact Alexa. I WANT TO UPLOAD AN AUDIO CLIP LIKE MP3 OR WMA FORMAT OR AAC FORMAT INTO MY BLOG ... IS THERE NO OTHER WAY TO ADD , OTHER THAN VIDEO OR IMAGE . SHGOULD I ENGAGE A MUSIC PLAYER INTO THE BLOG . For MP3 see How to Add Streaming Audio in Blog? Also turn off CAPS LOCK. Typing in CAPS is like shouting in the real world. I am a fan of your blog. I have learnt a lot from your blog. Lots of my HTML related problems I have solved from your articles. Very helpful, thanks. I went the Google Groups route and had no problems. I just added the document using the link function. Holy schmoley is it ever hard to find a decent file hosting site that you can link files in for downloading from your blog! The instructions you have above seem to work but it does seem like a work around to be able to do this...why aren't there any good file sharing sites that allow you to direct link your documents in your blog (without all that advertising, or requiring non-users of their site to become a user of their site...)--I mean, many of the document sharing sites have a fee for premium accounts that supposedly allow you to direct link, but what they do not tell you is that ONLY YOU or other premium users can use that direct link...so if my average blog reader clicks a link to one of my documents I have posted out there, then they end up interfacing with this webpage that requires them to be a user of the site before they can access the document...so FRUSTRATING. Are there really no good document sharing sites out there that allow you to direct link on your blog wihtout requiring the person attempting to download the doc to be a user of that site? I do not mind paying money for this sort of service, but my issue is that I cannot seem to find this sort of service...so, dear Vin, do you know of any sites like this? By the way--you have a fantastic blog. So helpful to the novice blogger like me. Try Fileden.com or just Google for "free hosting". Thank you so much for this article. Looks like Google Groups will solve my problem nicely. that's really interesting...even though I have still loads of problems... I don't know what's wrong. I copy the ....LINK OF YOUR FILE AT FREE HOST">DOWNLOAD FILE.... into my post. I copy the link to my freehosting where the are capital letters. I click publish and it said that the tag is not working, it can't be accepted. Is the procedure right? What's wrong? Can you help me please? What is the link of your post? I had problems uploading sound file .Thanks a lot Doc. Hi, I like your above post. Very useful information here. Thanks for nice shearing. I will try this... definitely! Keep ending up here with my questions,very useful big up! Question: I have a system of linked html documents they are linked to each other by hyperlinks. Once upon a time I was able to upload this collecftion of interlinked html docs using ftp. I gather this is no longer possible in blogger...any advice? Really need these interconnected documents. what if i want to upload any file rather then image file? is blogspot give this facility ?? Thanks for providing this type of very helpful information. I enjoyed reading it,it is excellent! Thanks a lot! plz tell me how to host free pdf file. Can also use google docs to host files. work fine, but how to download file in the same page / not direct to another page ?